After a long period of low volatility, the measurement of stock price movement has moved much higher in 2018. Higher volatility is usually accompanied by big down days in the stock market. Over the last five months, the U.S. market has turned from a place of easy profits to one that has been tough on investor portfolio values. To make lemonade from lemons, consider those investments products that can pay you more based on increased volatility. Measured volatility increases when the stock market goes down. The reason the metric was so low in 2017 is because down days were few and of limited magnitude. A recent article from Bloomberg highlighted the fact that in 2018 the average down day move of the S&P 500 this year has been 24% greater than the average up day gain. This is the largest gap since 1948. 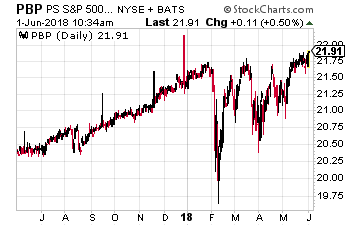 As I noted, down days result in increased volatility, so it’s understandable that even though the current S&P 500 is close to where it started the year, volatility has made stock investing more nerve racking. 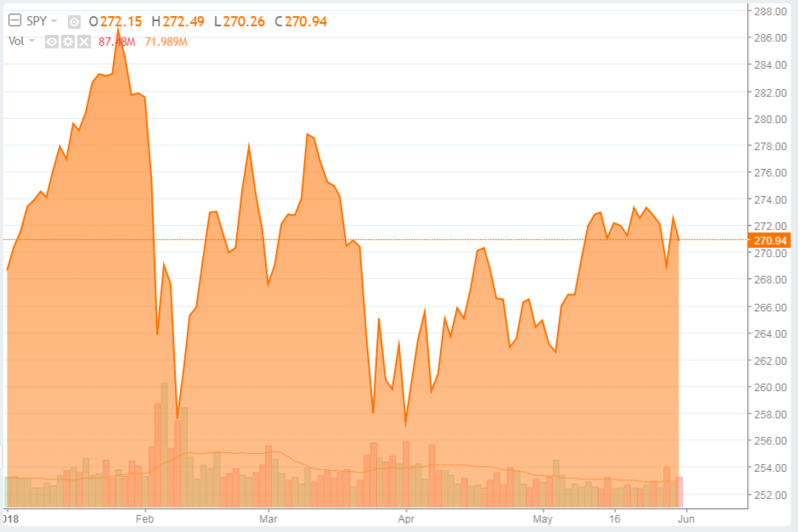 This year-to-date chart of the SPDR S&P 500 ETF (NYSE: SPY) graphically illustrates the volatility. The widely quoted volatility index or VIX is derived from the prices of options contracts trading against the S&P 500. Many investors do not know that VIX is just a measure of options prices. This means that when volatility or VIX is elevated, traders who sell options are making more money. While options trading can be complicated and risky, there are income focused investment products that use option selling to enhance cash flow and support dividend payments from a portfolio that without options would not carry as attractive a yield. You can find these buy-write or covered call products in the form or ETFs or closed-end funds. When you invest in one of these funds, you should look for recent dividend increases due to higher volatility, or if you buy shares in funds that haven’t yet increased payouts, sell the shares if you don’t get a dividend boost in the next quarter or two. PowerShares S&P 500 BuyWrite ETF (NYSE: PBP) is the largest buy-write ETF by assets under management. As an ETF, the fund tracks a specific index, in this case the CBOE S&P 500 BuyWrite Index. This strategy consists of holding a long position indexed to the S&P 500 Index and selling a succession of covered call options, each with an exercise price at or above the prevailing price level of the S&P 500 Index. The fund’s one, three and five year annualized returns have been 6.59%, 6.36%, and 6.57%, respectively. These returns reflect the ETF’s 5.0% yield plus most share price gains. Dividends vary significantly from quarter to quarter. Nuveen S&P 500 Buy-Write Income Fund (NYSE: BXMX) is a closed-end fund that seeks to substantially replicate the price movements of the S&P 500 Index and by selling index call options covering approximately 100% of the Fund’s equity portfolio value with a goal of enhancing the portfolio’s risk-adjusted returns. This fund has picked up more return from share price gains, averaging 10.7% over the last three years, against a 7% dividend yield. Pricing is reasonable, with BXMX shares trading at a 1.3% premium to NAV. 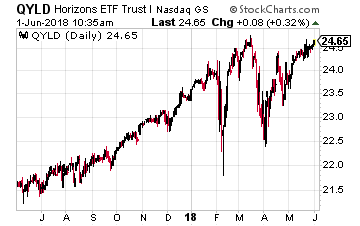 Horizons NASDAQ 100 Covered Call ETF (Nasdaq: QYLD) is an ETF that tracks the CBOE NASDAQ-100® BuyWrite Index. As a result, this ETF will be more focused on the large technology stocks that make up a large part of the Nasdaq 100 stock index. QYLD pays monthly dividends that have been quite consistent. One-year and three-year average returns have been 12.3% and 10.3%, respectively. The ETF carries a 10% yield, so most of your return will be the dividend payments. 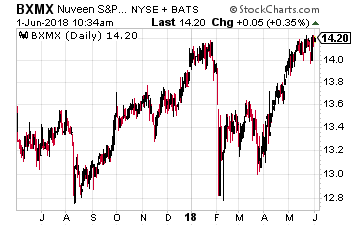 Nuveen Nasdaq 100 Dynamic Overwrite Fund (Nasdaq: QQQX) is a closed-end fund using the Nasdaq 100 Stock Index as its basis for covered call writing. Nuveen puts the “Dynamic” in this fund by selling call options on 35% to 75% of the value of the Fund’s equity portfolio –with a 55% long-term target– in an effort to enhance the Fund’s risk-adjusted returns. QQQX has put up an impressive 18.66% average return for the last three years while paying an approximate 6% dividend. This is a buy-write fund that will give you a greater portion of the changes in the underlying stock index – either up or down. 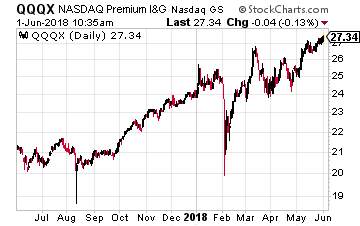 QQQX is trading at a very stiff 15.6% premium to NAV. 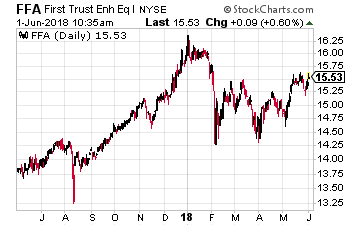 First Trust Enhanced Equity Income Fund (NYSE: FFA) is a closed-end fund where the managers actively manage the stock portfolio and enhance income by selling call options. The fund has produced a 6.8% average return for the last three years, and 9.5% per year over the last five years. Currently call options are out on 55% of the portfolio. The dividend yield is a handsome 7.4% and the dividend rate has been increasing since 2013. The shares are trading at a 6.1% discount to NAV.